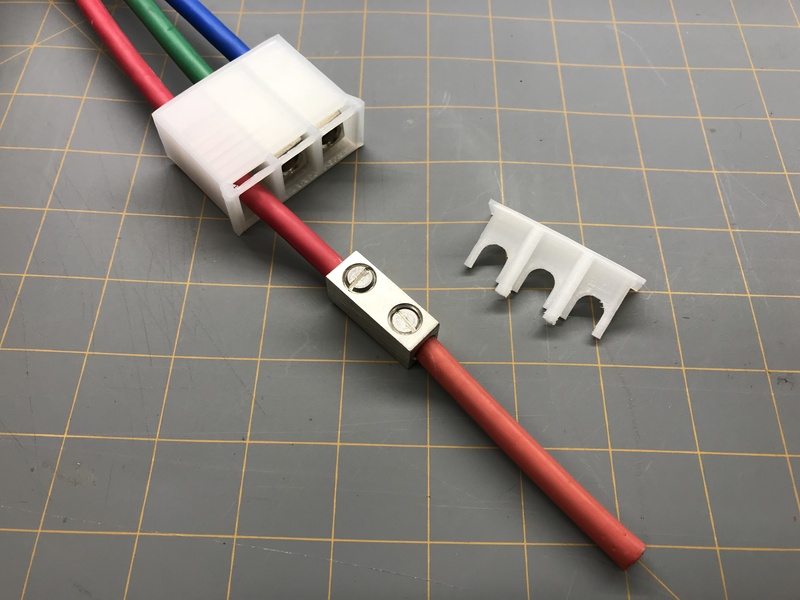 In my last post, I showed a prototype 3D print of the 240V Quick Disconnect. Here are the results of the final 3D print. I’ve got the final version of the 240V Quick Disconnect printed in in natural colored Bridge taulman3D industrial high strength nylon. It is insanely strong! The first nylon 3D print failed because I forgot to include a skirt, so the edges curled up slightly, and I didn’t notice until it was complete. It still worked, but it bothered my OCD, so I reprinted another, only took an hour anyway. I ran over that first nylon print with my truck (laying flat), and it didn’t get so much as a scratch on it. The slide lock completely prevents finger access to the Burndy splice connectors. Still, this is not something you should attempt if you are not familiar with electrical safety and codes. Your best bet is to higher an electrician to add a permanent outlet. This assembly setup is for testing purposes only, and I know what I’m doing. Don’t try this at home. Things you should understand if you do try this at home is the earth ground system in your home electrical wiring. You should also understand how NOT to overload circuits, that’s a significant fire hazard. The NEC can help here understand load maximums on a given wire gauge. Finally, understanding how transformers isolate you from the shocking truth will help you understand how the work coil is electrically separated from your home or shop AC grid. Remember, Safety should always be first! The voltage and current coming from your wall outlets can kill and should always be respected. The updated CAD 3D print files are on on the Thingiverse Project. This assembly houses 3 Burndy splicers (PN: AMS2BAG2R). It does a few important things, it isolates them from each other, from the breaker box, and it snaps closed to prevent the lugs from sliding out (and attacking passer buys). On the side where the wires enter the assembly from the breaker, it is closed off except for holes just big enough for them, so it’s impossible for the splicers to slide out from that side. There are also ears on the front to keep the entire assembly from sliding all the way in the breaker box.